has developed the first ever twelve-minute mechanical clock. that revolves every twelve minutes vs. sixty seconds. This allows pilots to better gauge the amount of time elapsed. The stop, start and flyback of second and minute hands do not disturb the time of day. The lever for adjusting rate is accessible without removing the clock from its case. The clock contains an anti-magnetic, temperature compensated hairspring to insure accuracy. 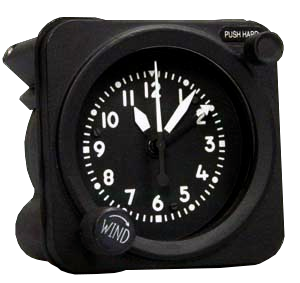 All Waltham mechanical aircraft clocks are domestically produced and are certified to conform to FAR#52.208-1. They contain domestic jewels.